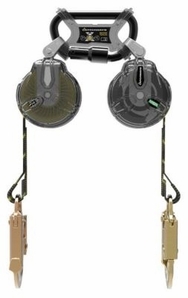 The MSA 63111-00B Latchways Mini Retractable Lanyard is the most compact & lightweight self-retracting lanyard ever developed using multiple spring radial energy-absorbing technology. This new design eliminates the need for an external energy-absorber outside of the housing making it the smallest retractable lanyard on the market. Meets or Exceeds ANSI Z359.14 (Class B), CSA Z59.2.2, OSHA, EN360:2002.